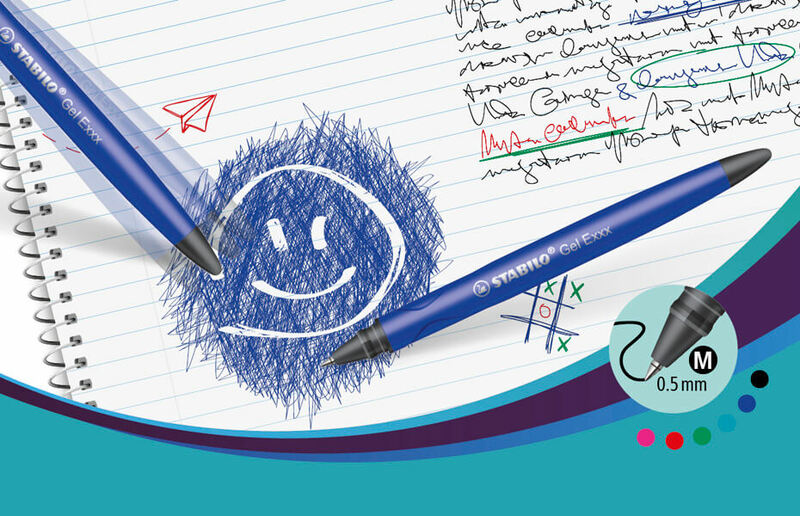 Our new erasable rollerball is a true multi-talent, enabling you to easily correct mistakes! Whether you are writing, erasing or correcting, the STABILO Gel Exxx is perfect for school, college and the office! The STABILO Gel Exxx is the ideal companion for those who love optimal writing comfort. With its medium tip the rollerball not only ensures a pleasantly soft writing feel, but also attractive handwriting. And in case small mistakes are made, no problem! Thanks to the erasable ink, spelling mistakes can be corrected in no time: just erase and write over them. The STABILO Gel Exxx is available in 6 different ink colors and is refillable with STABILO Gel Exxx refills. Writing, erasing and correcting all in one. Correct errors easily thanks to remnant-free erasable ink and integrated eraser. Refillable with STABILO Gel Exxx refills. Available in 6 different ink colors. STABILO Gel Exxx comes in six colors.